Fluorescence imaging is widely used for visualizing biological tissues such as the back of the eye, where signs of macular degeneration can be detected. It is also commonly used to image blood vessels during reconstructive surgery, allowing surgeons to make sure the vessels are properly connected. For these procedures, as well as others now in clinical trials, such as imaging tumors, researchers use a portion of the light spectrum known as the near-infrared (NIR) -- 700 to 900 nanometers, just beyond what the human eye can detect. A dye that fluoresces at this wavelength is administered to the body or tissue and then imaged using a specialized camera. Researchers have shown that light with wavelengths greater than 1,000 nanometers, known as short-wave infrared (SWIR), offers much clearer images than NIR, but there are no FDA-approved fluorescence dyes with peak emission in the SWIR range. A team of researchers at MIT and Massachusetts General Hospital has now taken a major step toward making SWIR imaging widely available. They have shown that an FDA-approved, commercially available dye now used for near-infrared imaging also works very well for short-wave infrared imaging. "What we found is that this dye, which has been approved since 1959, is really the best, the brightest fluorophore that we know of at this point for imaging in the short-wave infrared," says Moungi Bawendi, the Lester Wolf Professor of Chemistry at MIT. "Now clinicians can start to try short-wave imaging for their applications because they already have a fluorophore which is approved for use in humans." 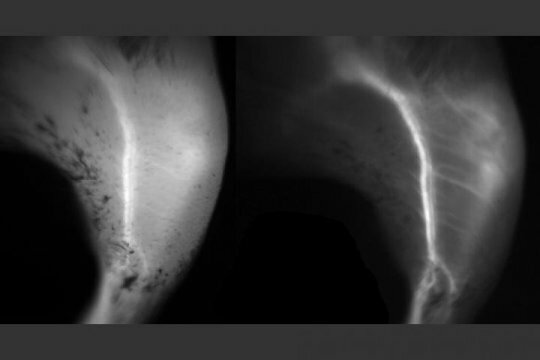 Imaging this dye with a camera that detects short-wave infrared light could allow doctors and researchers to obtain much better images of blood vessels and other body tissues for diagnosis and research. Bawendi and former MIT research scientist Oliver Bruns are the senior authors of the study, which appears in the Proceedings of the National Academy of Sciences. The paper&apos;s lead authors are MIT graduate students Jessica Carr and Daniel Franke. The dye that the researchers used in this study, known as indocyanine green (ICG), fluoresces most strongly around 800 nanometers, which falls within the near-infrared range. When injected into the body, it travels through the bloodstream, making it ideal for angiography (the visualization of blood flowing through vessels). Some robot-assisted surgical systems have incorporated NIR fluorescence imaging to help visualize blood vessels and other anatomical features. The MIT team discovered ICG&apos;s usefulness for SWIR imaging somewhat serendipitously. As part of a control experiment for another paper, they tested the fluorescence output of quantum dots against the fluorescence output of ICG in the short-wave infrared. They expected that ICG would have no output, but were surprised to discover that it actually produced a very strong signal. Bawendi&apos;s lab and other researchers have been interested in developing fluorophores for SWIR imaging because SWIR offers better contrast and clarity than NIR. Light with shorter wavelengths tends to scatter off of imperfections in objects that it strikes, but as wavelengths become longer, scattering is greatly reduced. "In the near-infrared, a lot of the features you see in tissue can look foggy, and once you move into the short-wave infrared, the image clears up and everything becomes sharp," Bruns says. Short-wave infrared can also penetrate deeper into tissue, although calculating exactly how far is a complicated process, the researchers say, because it depends on the size of the structure being viewed and the field of view of the microscope. In the new study, the researchers were able to see several hundred micrometers into tissue using a regular fluorescence microscope. Normally, this depth can be reached only with two-photon microscopy, a much more complicated and expensive type of imaging. "We found that short-wave infrared is particularly useful for imaging small objects that are on top of a large background, so when you want to do angiography of small vessels, or capillaries, that&apos;s significantly easier in the short-wave infrared than in the near-infrared," Franke says. In their study, the researchers further explored ICG and showed that it gives a stronger signal than other SWIR dyes now in development. Previous studies of ICG had focused on its emission around 800 nanometers, where it fluoresces the brightest, so no one had observed that the dye also produced a strong signal at longer wavelengths. Though it doesn&apos;t fluoresce efficiently in the shortwave-infrared range, ICG absorbs so much light that if even a small percentage is emitted as fluorescent light, the signal is brighter than that produced by other SWIR dyes. The researchers also found that ICG is bright enough that it can produce images quickly, which is important for capturing motion. "If you don&apos;t have a strong enough signal, it slows down how long it takes to take the image, so you can&apos;t use it for imaging motion such as blood flowing or the heart beating," Carr says. The researchers also tested another dye that works in the near-infrared. This dye, called IRDye 800CW, is similar to ICG and can be attached to antibodies that target proteins such as those found on tumors. They found that IRDye 800CW also fluoresces brightly in the shortwave-infrared light, thought not as brightly as ICG, and showed that they could use it to image a cancerous tumor in the brains of mice. To do shortwave-infrared imaging, research labs and hospitals would need to switch from the silicon cameras now used for NIR imaging to an indium gallium arsenide (InGaAs) camera. Until recently, these cameras have been prohibitively expensive, but the prices have been coming down in the past several years. The research team is now further investigating why ICG works so well for shortwave-infrared imaging, and is trying to identify the optimal wavelength for its use, which they hope will help them determine the best applications for this kind of imaging. They are also working with other labs to develop dyes that are similar to ICG and might work even better.